I feel this is the most appropriate exchange for this question I hope someone could bring some insight into an area I know very little about. I would like to find a way to detect and log the time which an object enters and leaves a specific area. The area would need to be defined in a 3 dimensional way and the object would be made specifically for the purpose of being detected. one of the ways to do this is by using the military way i.e. by using 3D Radars. But, it is quite difficult and expensive to build one. But one of the cheaper and more interesting way is by using Beacons. 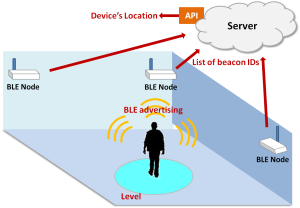 Beacons are small devices used mostly for indoor mapping and tracking. You can place minimum 3-4 beacons in your room which will transmit BLE and WiFi signals. The object you say which will enter the room will have a WiFi and BLE scanner or a sensor, which will connect to these signals. Depending upon the RSSI i.e. the Received Signal Strength from each of the beacons you can identify the location of your object. This method is called Triangulation Method.